"Recently I was on a VFR flight and noted a significant discrepancy between the altitude indicated on my altimeter, and the reported altitude on my handheld and installed GPS units (which agreed with each other). I was sure to set the altimeter to what was reported at the departure airport and airports I overflew continued to report the same altimeter setting. Which do I use?" - Will R.
"You would never fly the GPS altitude. Our airspace system is based on aircraft flying pressure altitude which provides that aircraft using the same altimeter setting will be using the same reference and thereby maintain safe vertical separation from each other on a given day with a given temperature. This is why altimeters, and specifically the pitot static system of an aircraft, need to be checked every 24 months for IFR flight. It is important for pilots to understand that the altimeter is a barometric device that measures pressure, not altitude. As an example, with a barometric pressure of 29.32 on a day with standard temperatures the difference between the GPS altitude and the altimeter might be as much as 600 ft. We would have chaos in the airspace system with some aircraft at significantly different altitude than others. Separation would be compromised. 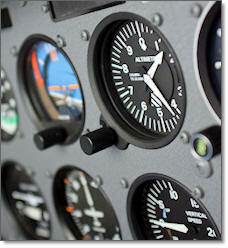 All aircraft should be setting their altimeter to a local setting before departure. They should adjust the altimeter enroute using altimeter settings from ATC or perhaps if you're VFR from ATIS in the area or AWOS or ASOS. Many of these are available throughout the country and certainly would be available on a given route of flight. No aircraft (including VFR aircraft) should be using GPS altitude. If you have a certified Mode C transponder in your aircraft it should not be turned off unless instructed to do so by ATC. FAR 91-215 requires that the transponder, including mode C be turned on."